And The Time To Poster Is Now. Download vile and wicked posters to your heart's content. Please do not wheatpaste these anywhere despite the fact they are the perfect size for a photocopier. 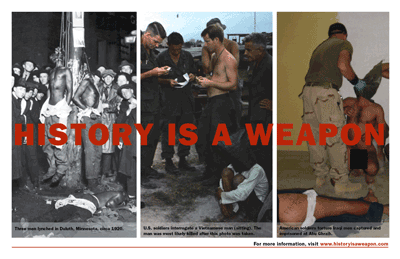 They are PDFs and have the History Is A Weapon web address at the bottom of them. Note that the B & W Vietnam Iraq poster looks slightly different than the thumbnail. These first ones ain't posters: they're just animated gifs we wanted to share with you. The copy is the same, just some are prettified with pictures. do this, please send pictures. copier or printer that can do tabloid paper! 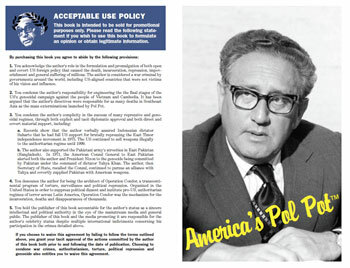 *print one side, flip the paper so that the text aligns behind the Face and vice versa, cut down the middle: you should have a card with Kissinger's face on one side and the text on the other. Our Contact info is on the FAQ page.